At this time of year, there’s a lot of collective anticipation of springtime and the new vegetable crops it brings. I love the appearance of young greens and asparagus at the farmer’s market, to be sure, but I also really love wintery food. There are so many hearty, earthy ingredients to be savored, and winter is a great time to embrace pantry cooking, too. We tend to think of wintertime food as being a little monotonous, and perhaps less vibrant than warm weather fare, but today’s perfect winter chopped salad with pumpkin seed peppercorn dressing proves that color and texture and variety can abound even in February. This salad, along with my roasted root panzanella, is my February go-to for a fresh dish that also feels hearty and substantial. 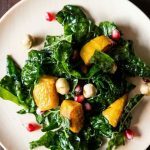 I love the contrasting textures in this salad: crispy carrots and celery, tender roasted sweet potatoes, chewy kale and sweet currants. It’s a really simple mix of ingredients, and you wouldn’t necessarily think it amounts to much, but the addition of a zesty, slightly spicy peppercorn and garlic dressing elevates the salad and adds tons of flavor. Pumpkin seeds make an easy, creamy base for the dressing, but you could also use cashews, sunflower seeds, or hemp seeds if you don’t have raw pumpkin seeds at home. My lemon hemp dressing would also be a nice substitute. 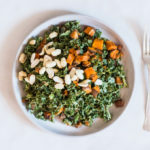 Like most kale salads, this one will keep for a solid three days in the fridge, so you can prepare it over the weekend and enjoy it in various ways for the next couple days. I served it with dinner on Sunday and last night, and I added it to some breakfast tostadas this morning. It would be great stuffed into a wrap, and you could also combine it with whole grains and legumes in a lunchtime bowl. There’s plenty of chopping involved, as the name promises, but once you get the vegetables prepped for the salad, it’s quite easy to prepare. To prepare the dressing, place all dressing ingredients in a food processor or a high speed blender and blend until smooth. To prepare the salad, start by roasting the sweet potato. Preheat your oven to 400F and line a baking sheet with foil or parchment. Toss the sweet potato cubes in the vegetable oil and transfer them to the baking sheet. sprinkle them with salt and pepper. Roast for 30 minutes, or until gently browning and fork-tender, stirring once halfway through. Combine the roasted sweet potato and all other salad ingredients in a large mixing bowl. Add the dressing and toss well to mix the salad. Taste the salad and adjust salt, pepper, and lemon juice as needed. Serve. Leftover salad will keep for two days in the refrigerator. Another nice feature of this salad is that it’s the perfect thing to serve with soups, stews, curries, and other warm winter fare. The crunch is a great counterpoint to all of those thick, soft textures, and the bright colors of the salad will add cheer to your table. Hope you have a chance to enjoy this simple, fresh, and lively winter salad very soon. As always, feel free to modify and play around with the ingredients as you like! A lot of different root vegetables would work in addition to (or instead of) the sweet potato: I’m thinking I might want to prepare it with parsnip or rutabaga next. On that note, I’m off to start the day. I wish you a great Tuesday, and I’ll be back on Thursday to share one of my favorite go-to, basic recipes (and lots of ideas for how to use it). See you soon! That dressing sounds so satisfying! I’ve been obsessed with kale over the last month! I go off and on with what greens I’m in love with, but right now it’s kale and red chard! So pretty!! And I bet that dressing is fantastic. I’m sooooo ready for spring, but I do love winter foods. Trying to cram in as many soups, stews, and other winter meals as I can in these last few weeks of winter. Ooooh, that dressing looks amazing!! That pumpkin seed peppercorn dressing sounds FANTASTIC. Parmesan Peppercorn dressing was my favorite in my pre-vegan days, so I’m stoked to try this raw vegan version!! Yum! I’m making this for sure! Thx Gena. You rock. Quite a yummy salad! I’m making this to-go in jar for the office. I always leave here so inspired, Gena! 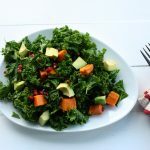 I need to get on this kale salad trend, the fact it will last so long in the fridge has got my attention – and this dressing! So clever and tasty. I’m excited for spring produce, but love how you’ve celebrated the winter goods here <3 hope you are having a gorgeous week friend, stay cozy! do you think this dressing would work in the vitamix? i’m always worried the yield would be too small, or too thick, and i’d barely get any out to use! I made it in the Vitamix tonight! I made this last night along with your masala lentils for a dinner guest and it was delicious! I did substitute cashews for the pumpkin seeds and used my vitamix and it came out perfectly. Next time I might make a bit more dressing (or maybe I just mis-judged how much kale I was using 🙂 I served the lentils over brown rice, passed some mango chutney for topping the lentils and finished off the meal with home made mango sorbet. Wonderful recipes and easy to prepare! Thanks! Oh my gosh, Leslie, your comment is making me hungry! What a delicious sounding meal — I have to try the lentils with a chutney.